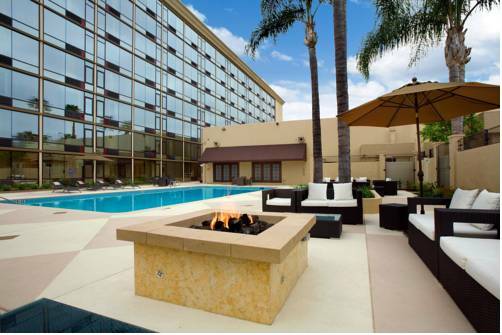 The Red Lion Hotel Anaheim Resort is conveniently located blocks from the Disneyland Resort and the Anaheim Convention Center, guests will appreciate comfortable amenities and the hotels warm, inviting atmosphere. The hotel is also just moments away from all the fun and excitement of Southern California destinations including Medieval Times, Pirates Adventure Dinner, Anaheim Stadium, Honda Center, Knotts Berry Farm and local shopping at the Anaheim Garden Walk. Sun-worshippers can take an easy trip to experience the famous Newport and Huntington Beaches. The Red Lion Hotel Anaheim Resort is certified with Disneyland as a Good Neighbor hotel offering 2 and 3 day ParkHopper passes at the front desk. Our hotel is a non-smoking facility that offers a fitness center, an outdoor heated pool that is open year-round until 9pm, a business center with guest work station, restaurant, lounge and our Cafe2Go grab-and-go outlet for travelers in a hurry. We offer Red Lions signature Roaring Start Breakfast Buffet and do not forget, kids 6 and younger eat free with each adult. Hotel has 15.00 per day self onsite parking. Our 308 renovated guestrooms in the Red Lion Hotel Anaheim feature Stay Comfortable plush pillowtop beds, ergonomically designed work areas, imported granite and tile baths, iPod docking stations, refrigerators, microwaves, in-room safes, and flat-screen TVs. For meetings, the hotel offers over 5,000 sq ft of flexible meeting space. To help you remain connected, the property offers complimentary wireless Internet access in guest rooms, the lobby, pool areas and meeting and banquet rooms.